I hope your weekend is going great. I had a nice time yesterday....my husband and I took the kids out to dinner, we did a little (grocery) shopping, and rented some movies that they had been wanting to see. I wasn't able to spend any time in my scrapbook room yesterday, but I hope to a little bit today. 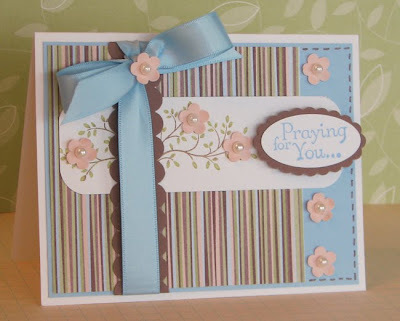 I do have a card to share with you from Twisted Sketches.....it is Card Sketch #5 and the twist is ribbon. 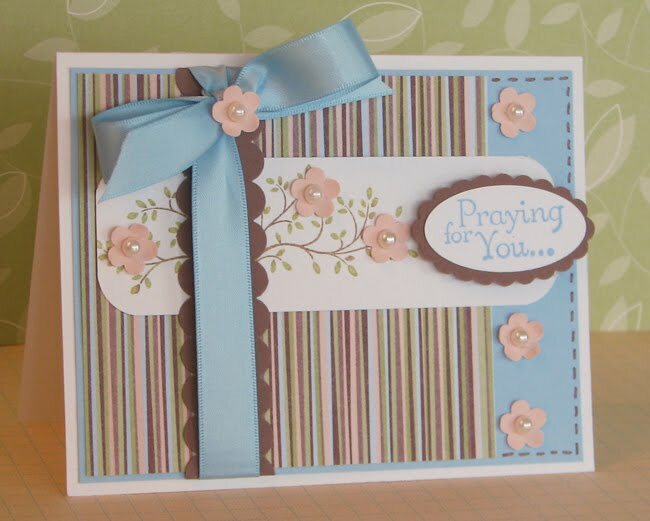 I also decided to do a sympathy card for the Little Red Wagon challenge....I really should keep some of these on hand because they can be hard to make when I need them. Cardstock, patterned paper, stamps, ink, ribbon, punches: Stampin' Up! I hope you hop on over to Twisted Sketches and play along with us. Oh, I totally, totally love this! I will be scraplifting this card very soon. Beautiful card! Thanks for playing along with Little Red Wagon! Just lovely, the foliage and flowers look fab on the long panel, goregeous colours too! I love the little peach flowers on the stamped branch. Beautiful! This is such a pretty card! I'm glad I stopped by and found it. Adorable. Wow, wow, owow! Gorgeous card. I hope you will come join us at Fantabulous Cricut Crawl on Monday. We will have some fabulous prizes and your work is so fantastic! Please come join us and show off your work! Yippee! Gorgeous card Amy. I love the colors and the delicate sprig of flowers with those pretty pearl centres. Beautiful.